Bolivia is one of the poorest countries in Latin America. Poverty affects the quality of life of the majority of the population. Description: Santa Cruz is the capital of the Santa Cruz department in eastern Bolivia. 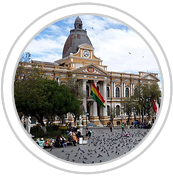 Situated on the Pirai River in eastern Bolivia, the city of Santa Cruz and its metropolitan area are home to over 70% of the population of the department and it is one of the fastest growing cities in the world. Cure4Hunger is charted to build more than 50 Food and Water Domes in Bolivia by 2025.